Chicken Enchiladas in 30 minutes? I still can hardly believe this meal came together so quickly. I needed a very fast dinner, because I’d lost track of time and hadn’t planned anything at all for our meal. A quick glance in the refrigerator showed me some leftover roast chicken that needed to be used. I grabbed a few things from the pantry and this meal was on the table in less than the time it would have taken me to pick something up for dinner or thaw something from the freezer. I had no intention of blogging this meal, but when I tasted the filling mixture of spicy sauce, chicken, corn and black beans; I knew I had a winner. The whole family loved this and requested the leftovers for the very next meal. We were far too impatient to wait for it to cool enough to slice pretty; so I’m sharing a shot of ooey-gooey cheesy enchilada “dip”. 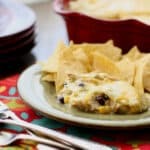 We scooped the hot enchiladas up with tortilla chips and loved every bite! Preheat the oven to 350 degrees. Combine the chicken, beans, corn, green chiles, 1 cup of the green chile sauce, sour cream and all of the spices in a large skillet over medium high heat. Stir occasionally as it warms for about 5 minutes. Pour about 1/2 cup of the green chile sauce into the bottom of a 9x13 pan. Place a layer of tortillas wedges across the green chile sauce and then scoop about a third of the chicken mixture from the pan on top of the tortillas. Sprinkle with 1 cup of shredded cheese. 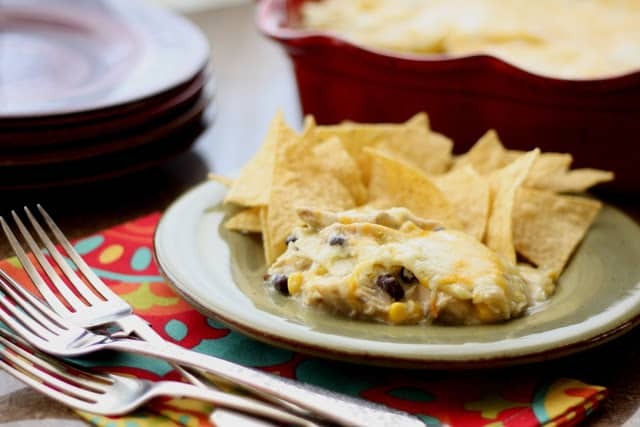 Layer with tortillas, top with another third of the chicken mixture and sprinkle with another cup of shredded cheese. Layer once more with tortillas and the chicken mixture, finishing with a layer of tortillas over the chicken. Pour the rest of the green chile sauce over the tortillas and sprinkle with the remaining 2 cups of cheese. Bake for 20 minutes, until the edges are bubbling. Remove from the oven and scoop piping hot onto plates or let cool for 15-20 minutes for a prettier slice of enchiladas. Serve with tortillas chips. Enjoy! Really? 30 minutes? I'm impressed!! You truly are a genius in the kitchen!! Sometimes the meal made on the run with whatever is to hand turn out the best. 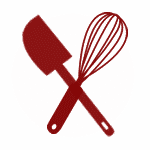 Fabulous flavors in minutes! who can ask for more!! Oh, wow. These sound amazing...my whole family would LOVE these! These took only 30 minutes? I love it already. The enchilada queen strikes again! Sounds delicious and a 30 minute meal is always welcome in my house! I could eat enchiladas at your house 7 days a week, love those things.